Vanessa (name changed for safety) found refuge and safety at a domestic violence shelter in Laredo, Texas, after her boyfriend threatened her with deportation. “They could deport me without my daughters, because [my daughters] are citizens,” she says. “I am both the mother and the father,” says Rubén España. 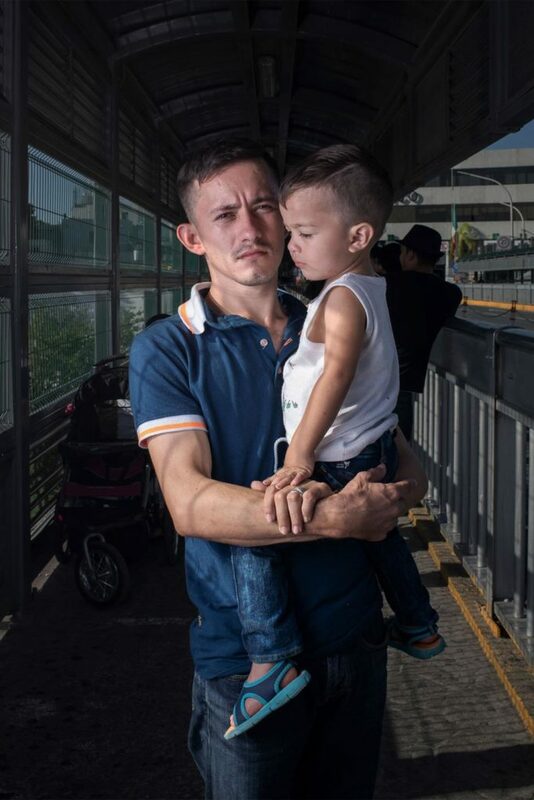 At 25, he’s a single father, and on the Mexican side of the Gateway to the Americas International Bridge, he holds his two-year-old son, Dylan Fabricio. The pair had spent two-and-a-half months walking and hitching rides from Honduras to Nuevo Laredo, Mexico. They’d been sleeping on a square of cardboard along the edge of the bridge with a hundred or so Hondurans, Cubans, and Venezuelans—waiting to cross into the U.S. to request asylum. 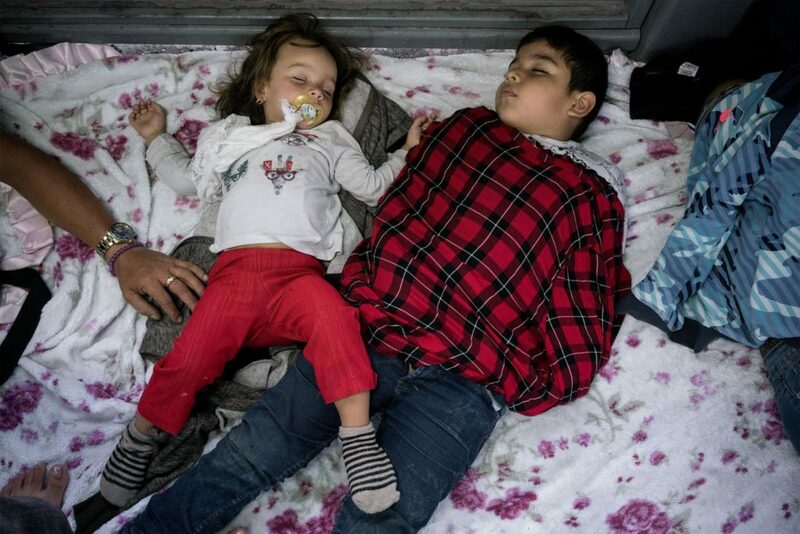 Two children sleep on the Gateway to the Americas International Bridge, waiting to be heard on their asylum requests. Migrants often wait days on the bridge to speak with a U.S. officer about their case. España heard news of President Trump’s separation policy while he was traveling. “I am scared, but I have to take that risk,” he explains. “Imagine if I am separated from my child, after all that I have fought for and suffered. But most of us take that risk, because we have no other option.” He says even if they separated him from his son, he preferred jail in the United States to deportation to Honduras and a likely death. He’s not alone in his gamble. 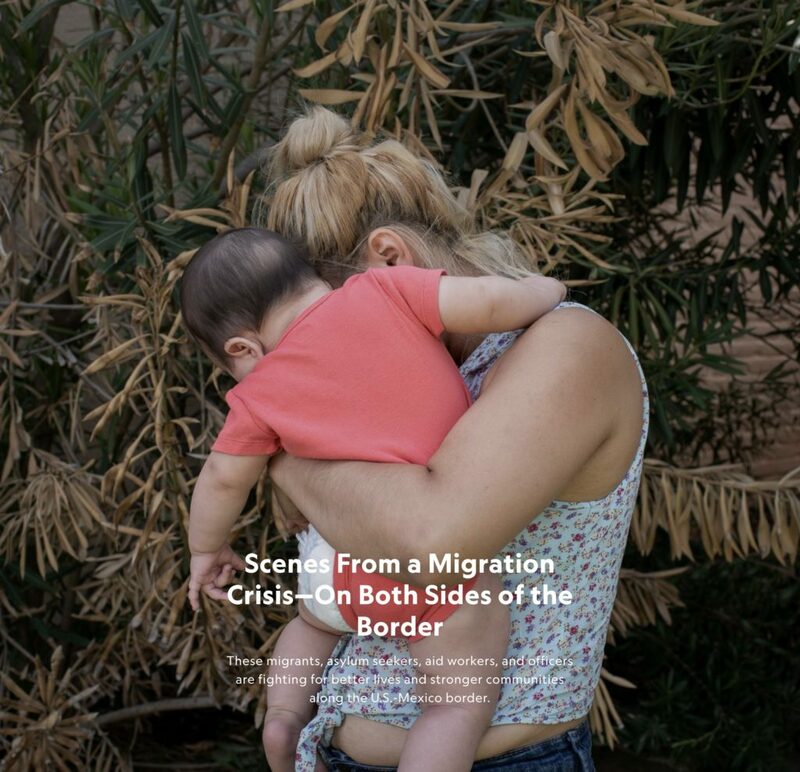 España is one of tens of thousands of people who come to the U.S. border every month—approximately 50,000 during each of the most recent in 2018—searching for safety and success. Though these numbers were similar to those in 2016, asylum seekers have reported a slow response by officials, claiming only five or ten people are seen each day in some locations, including the Gateway to the Americas International Bridge. The delay means people like España are spending multiple nights sleeping along the side of the bridge, waiting for their turn. 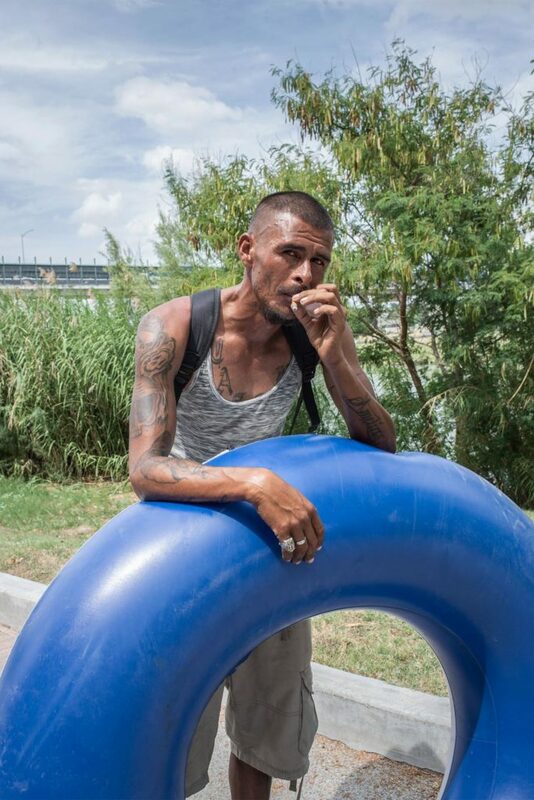 Manuel holds an inner tube he plans to use to cross the Rio Grande. 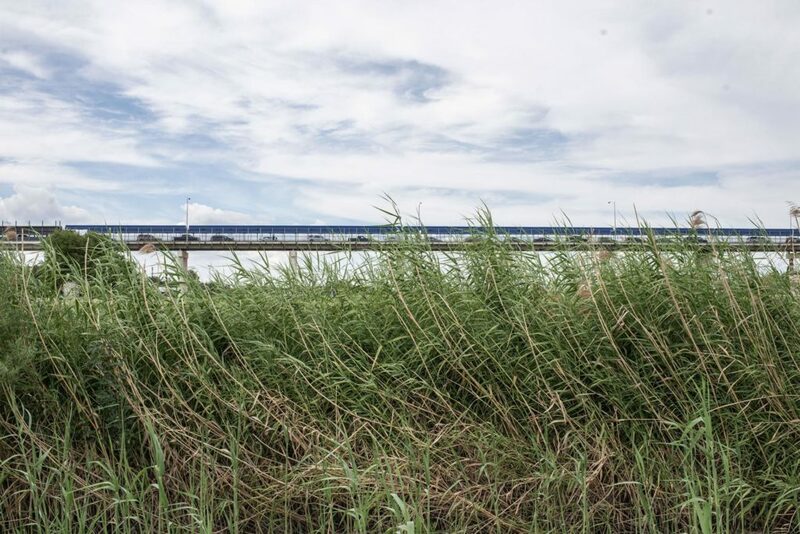 The river is a natural border between the U.S. and Mexico, and migrants sometimes swim across the flowing barrier in hopes of building a new life in the U.S. The crawling process is now compounded by a fear of recent Trump administration policies, particularly the decision to separate children from their parents once families reach the border. In recent months, 2,342 childrenhave been separated from 2,206 parents who crossed into the United States. The policy drew criticism from citizens and politicians along much of the political spectrum, and the growing crisis has been at the forefront of a global immigration conversation. On one side of the Gateway to the Americas International Bridge, immigrants wait in line to request asylum. 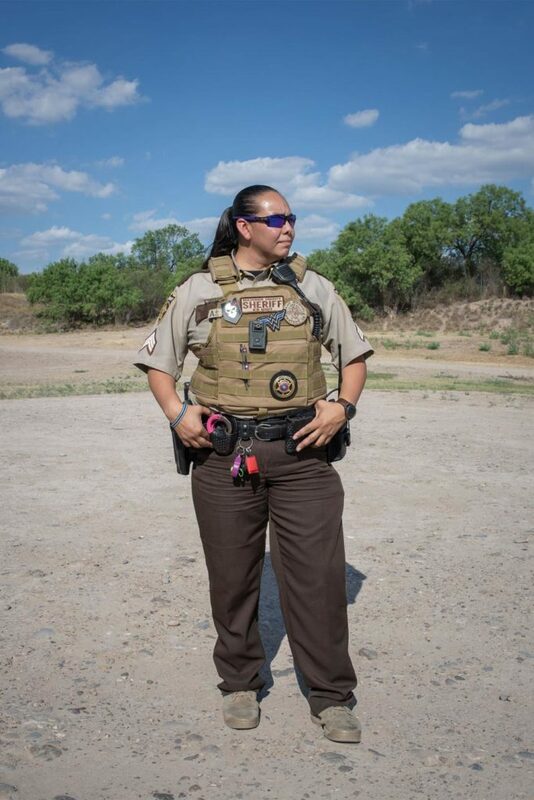 On the other, U.S. officers guard the border and call people across for appointments. Garillo’s fear of being denied entry is not unfounded. 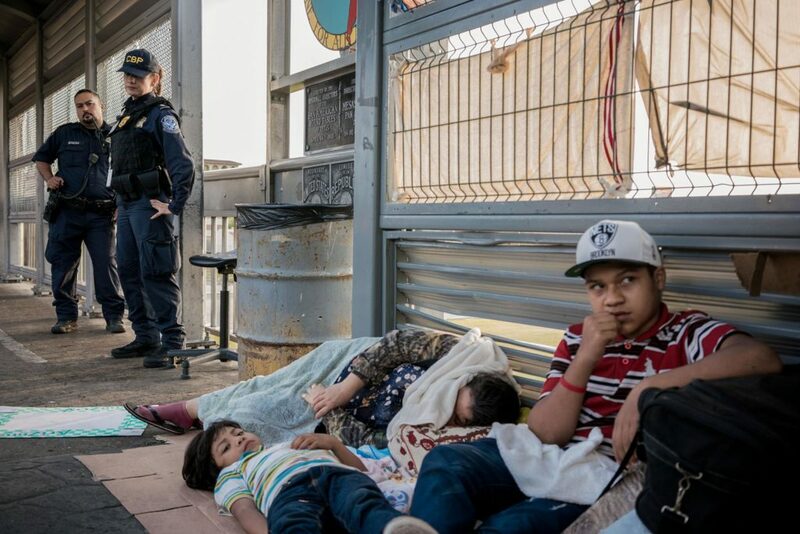 If the asylum seekers on the bridge aren’t successful, they may end up being deported—a fate met by the busloads of men who arrive back in Nuevo Laredo, Mexico, each day. Right: Francisco Rodríguez Granados stands at the bank of the Río Grande with his nephew Alfredo and niece Estrella Guadalupe. 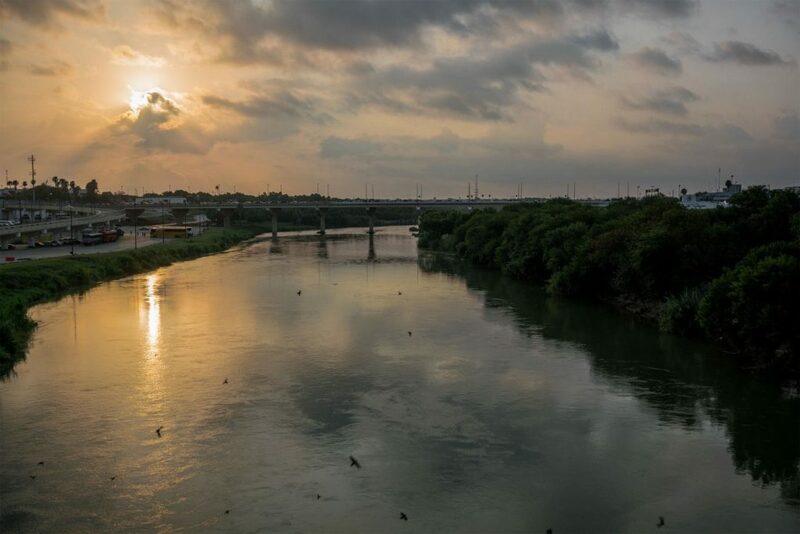 Daily temperatures in Nuevo Laredo can reach 110 degrees in June, and many families spend Sundays cooling off in the river. The regoin isn’t without danger, however, and Granados’ 10-year-old grandson drowned in the river in 2014. This visit marked just the second time he had returned since the accident. A man sits on the edge of the Rio Grande, which migrants sometimes swim across to enter the U.S.
One of these young men points at the expansive cursive tattoo that wraps around his neck. “These are the names of my daughters, Blanca Daniela and Lucía Liliana,” says José Antonio González. A construction worker from Guanajuato, Mexico, González hoped to find work in the U.S. and send money home to his wife and kids. After swimming across the Rio Bravo, he had entered the mountains in the U.S., where he lasted three days without water before being caught and sent to a detention center. Tattoos mark almost every inch of skin on his arms: dark, tangled lines of eyes and a crown of flowers on one side, the shaded form of a grim reaper on the other, and “La Vida Loca” in cursive on his wrist. Driven from his home and land by poverty and violence, González’s tattoos are a bodily memory, a way of carrying the life he left behind. The International Bridge connects Eagle Pass, Texas, and Piedras Negras, Mexico. He arrives at Nuevo Laredo’s Tamaulipas Institute for Migrants, a center dedicated to helping those deported from the United States, with 25 other deported men, all glistening with sweat on a morning when temperatures had already reached over 100 degrees. The founder and director of the institute, José Martín Carmona Flores, welcomes the men and tells them, “You are here because you were more skilled, more intelligent, more astute, more resistant, wiser. 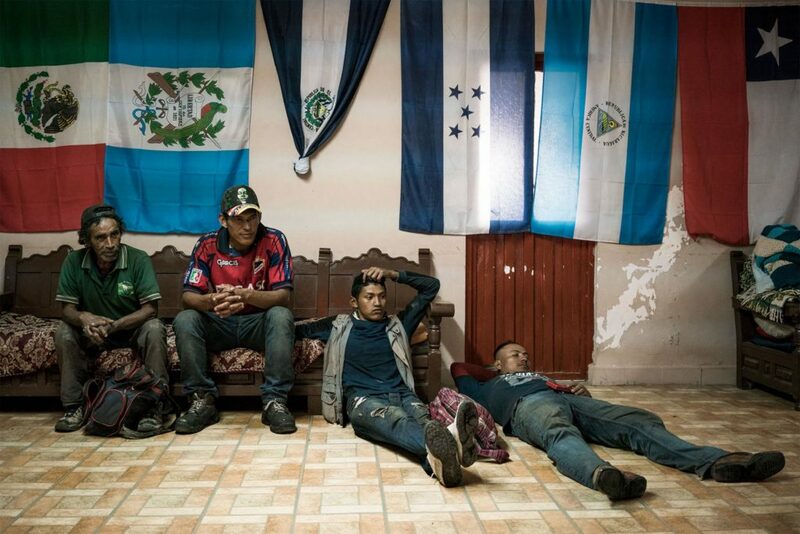 All of those qualities are required for triumph and success at home and in the family, in society.” Carmona Flores tells them the lessons they learned from crossing the border, getting work, and trying to send money home to their families could be applied to a new and successful life in Mexico. 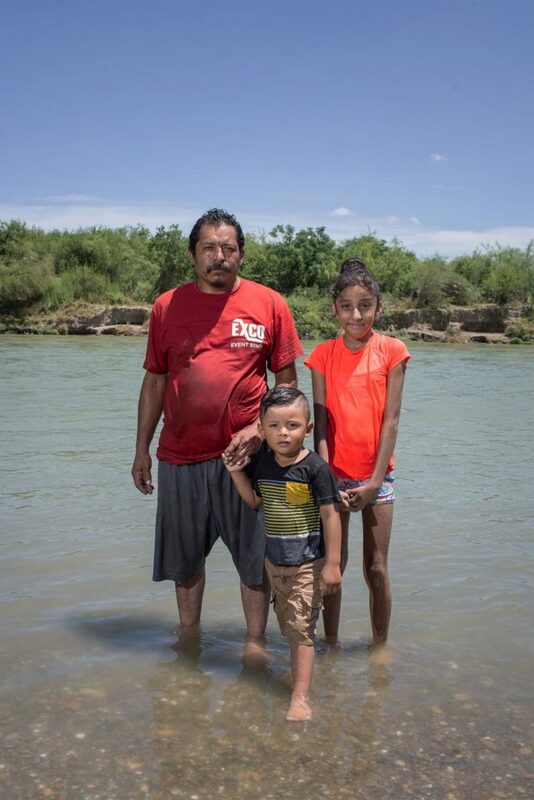 To see men like González cross the Rio Bravo and enter the U.S. illegally, one only has to go down to the edge of the river in Nuevo Laredo on a Sunday afternoon, when local families swim in the blue-green waters. At the height of the midday heat, when the border patrol changes guards, a group of eight young men cross the river, holding onto a pile of black plastic bags and kicking furiously. They slide onto the muddy U.S. bank in their underwear, pull clothes out of the black bags, get dressed, and disappear into the bushes. Light reflects off the Rio Grande, a natural border between Mexico and the United States, during sunrise. 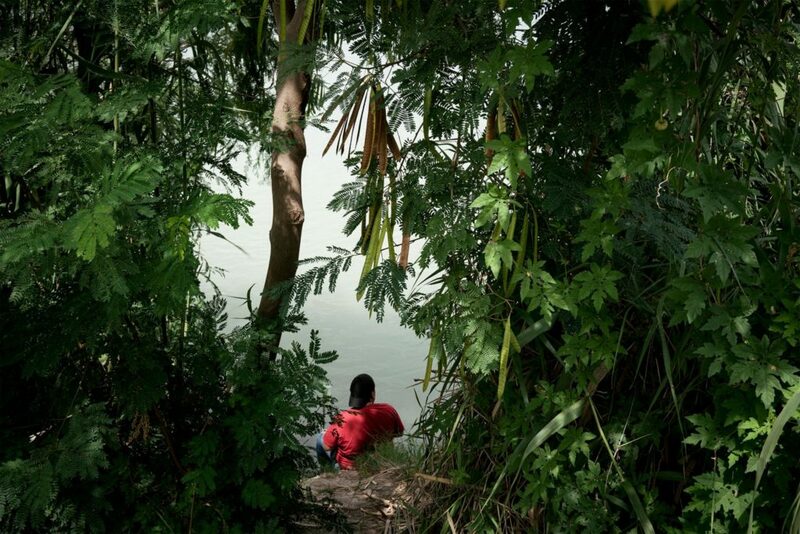 It’s not uncommon for migrants to swim across the river into the U.S. to escape violence or economic disaster in their home countries. Crossing into the U.S. is only the beginning of the obstacles for the men and women who chose this route. Some face a heightened risk of exploitation or abuse due to their lack of documentation. Sister Rosemary Welsh—a tall, strong woman with short-cropped hair framing her face—works to protect people in these insecure situations at Casa de Misericordia, a domestic violence shelter, in Laredo, Texas. In its 20 years of existence, the shelter has never turned anyone away—and most of the people served today are undocumented. To answer their needs, the organization works in coordination with other city and state agencies. Welsh parses no words when discussing how she believes the Trump administration has treated immigrants inhumanely. She volunteers in detention centers and has seen firsthand the effects of the new family separation policy. She’d recently been consoling parents who had been separated from their children without any knowledge of where they were or when they would be reunited. Frustrated by the practice and referring to the president, she asks, “What is this he’s got against the immigrant population?” Still, she understands the importance of collaboration. Soledad Casas stayed at the shelter for two weeks in 2000 and has been a volunteer ever since. She stands in a storage room full of clothing for those who arrive with nothing and talks about her kids—now 18, 15, 13, and 10 years old. Casas was undocumented when she experienced domestic violence. She says she stayed in that relationship for too long for fear of being deported without her children. The goal of Casa de Misericordia is to give women in Casas’ circumstances a way out and a support system to build a safer, more stable life. About 125 miles to the north in Piedras Negras, Mexico, Father José Guadalupe Valdés Alvarado breaks bread with the migrant community he serves at the shelter he directs. In the early morning, he prays with a group of men over plates of eggs, beans, and tortillas. After the prayer, while the men are eating, he returns to the community kitchen to help the volunteer cooks clean. His main objective at the moment, he says, given the immigration policies of the Trump administration, is to help reunite children separated at the border with their parents. That hope sometimes turns to fear once migrants cross into the U.S. Undocumented immigrants, many of whom have lived and worked along the border for decades, often fear being targeted by law enforcement. Although Texas is known for SB4, a law that allows local officers to enforce federal immigration regulations on behalf of a requesting federal agency and that the ACLU of Texas says “forces local governments and law enforcement agencies to do the work of federal immigration officers,” not all law enforcement members believe in such policies. 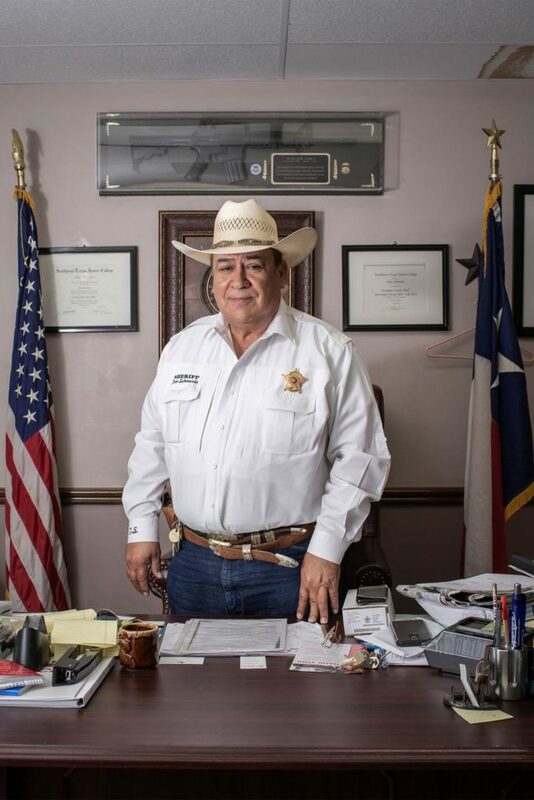 Across the border from Piedras Negras, in the town of Eagle Pass, Texas, the sheriff’s department doesn’t believe asking immigrants on the street for their papers accomplishes their goal of greater security. The International Women’s Media Foundation provided support for this project. Tamara Merino is an independent documentary photographer and visual storyteller based in Chile. Tamara focuses on human and social issues, identity and migration. Her work has been published in National… Read More. Luján Agusti is a visual storyteller based between Mexico and Argentina. Through her work she explores issues related to the Latin American culture and identity. She uses photography as her… Read More.